President Moon Jae-in was undaunted Monday by a swipe from North Korean leader Kim Jong-un and said he will keep pushing for another summit with Kim. "It is now time to pursue a summit with North Korea and make preparations," Moon told top officials in a meeting at Cheong Wa Dae. 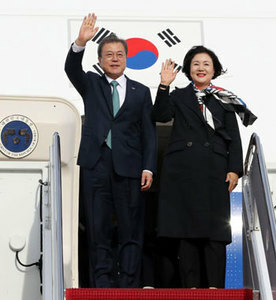 "If conditions permit, I hope that South and North can sit face to face without being restrained by the venue or format and discuss ways to achieve results that go beyond the two previous summits with the U.S."
Kim last September agreed to visit South Korea but later lost interest as sanctions remained in place, and last week he called on Moon to stop acting like "an officious 'mediator' and 'booster' that adopts a vacillating stand depending on the trend." Moon claimed U.S. President Donald Trump had expressed his support for an inter-Korean summit when the two met in Washington last week and "even voiced the possibility of a trilateral summit if Kim makes the decision." But there was no mention of that in official briefings by either Moon or Trump after their brief discussions. Moon made no mention of Kim's attack on him but claimed Kim "repeatedly voiced his will to denuclearize the Korean Peninsula and achieve peace." In last week's session of the rubber-stamp Supreme People's Assembly Kim made no mention of denuclearization, but he said he is "open" to meeting with Trump "one more time" if the U.S. changes its attitude.